Our Head Chef Lee brings a taste of the Middle East to the W5 menu this June with this heavenly starter which he describes as a ‘DIY Babaganoush’. Served with sourdough toast on the side and lying in a bed of Crème Fraiche and harissa, the roasted aubergine is peeled and sprinkled with toasted cashew nuts. The contrast between the soft freshness of the aubergine and the nutty crunch of the cashews is simply exquisite and dashes of horse rock salt and chives which create a wonderfully refreshing taste sensation. Drizzles of lime juice add extra zest. 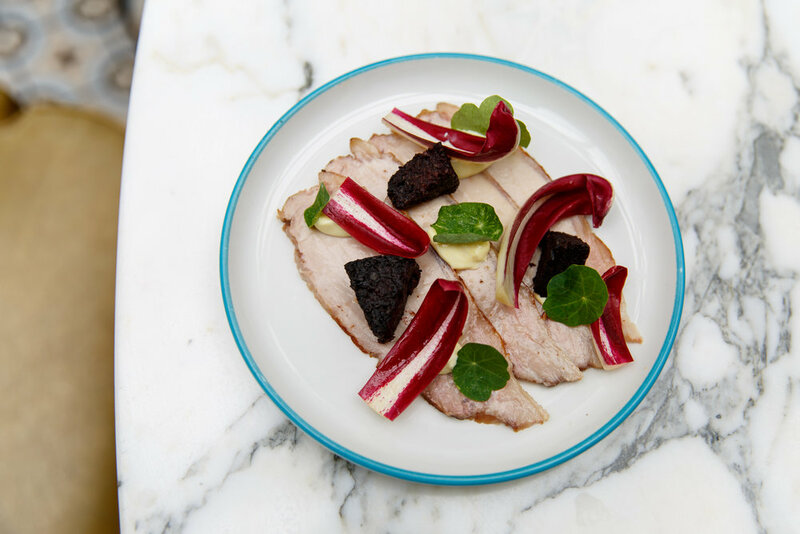 Taken from an exquisite English rare breed pork, the loin is caramelised on a planchar, transforming the colour into a lovely golden brown and cooked until it is beautifully tender and moist. Petite chunks of juicy diced black pudding crumble gently in the mouth and complement the texture of the soft pork and the addition of English mustard and yoghurt sauce create a lightly spicy dressing which brings out the flavours of the dish. Garnished in tardivo leaves to add a gentle crunch, the dish is light, fresh and served thin – almost like a cooked carpaccio. An amazing combination of flavours and textures this salad is exquisitely juicy and fresh! The menage of cooked green beans, raw baby spinach and charred sugar snap peas create an invigorating taste and pickled lemons add succulent zest to the dish – it is both effervescent and bitter. Crumbled feta brings it all together. Pairs perfectly with a glass of Riesling. Lying on a cassalay of butterbeans the effervescent sea bream is lightly baked, peeled and dressed in a lemon vinaigrette. The result is a delightfully fresh and light sensation which pairs perfectly with the richness of the butterbeans. Samphire seasons the dish wonderfully and the flat leaf parsley brings added refreshment – it is the perfect combination of warming and light. Probably the most original and unusual addition to the W5 menu this month. Head Chef Lee’s creation is simply delicious and showcases the best of British produce, from the butter to the cheese and the mushrooms. The peeled potato is confit in brown butter and cooked slowly until the inside is soft and the outside is gently caramelised and crispy. 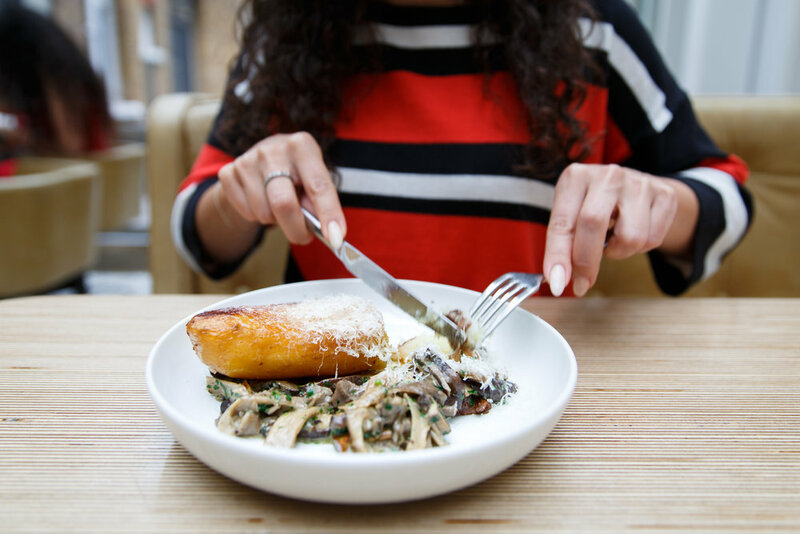 The classic combination of seasonal wild mushrooms and tarragon complement each other perfectly and evoke a smoky sensation which adds to the heartwarming nature of the fondant. Sprinklings of Berkswell cheese gently melt over the dish, rendering it juicy and wholesome. The perfect dessert for the Wimbledon season…The Succulent English strawberries are dressed in plain sugar and topped with citrusy Chantilly. Filling and fresh, the shortbread adds a delicate crumble and the lemon brings out a gentle acidity. Perfect to enjoy on our terrace with a glass of champagne. This heavenly sorbet is made from pink peaches which creates an almost creamy texture due to the high sugar content in the peach. Mixed with gooseberries, strawberries and raspberries it is a delightfully fresh alterntive to ice-cream!